The face of the earth is beleaguered with giant scars, scoured out in our ongoing bid to the plunder the planet of its natural resources. With explosions and massive machines scraping into the earth’s crust like a bad case of scabies, it’s small wonder open cast mining has made what many see as an unpleasant impact on the planet’s surface. Kalgoorlie Super Pit is what it says on the tin. 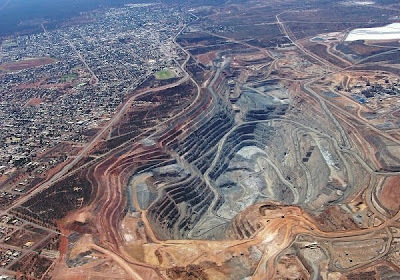 Irishman Paddy Hannan first saw the glimmer of gold here back in 1893, and this gigantic pockmark in Western Australia is now its continent’s largest open cut gold mine at 3.5 km long, 1.5 km wide and 360 m deep. It’s huge. And it’s growing. At least, that is, until 2017 when it is expected to cease being productive. While the Super Pit has the pull of a benign black hole for tourists into good hole-some fun, air pollution, water usage, noise and vibration issues and mining waste are all bones of contention for local residents. Still, as well as coughing up almost 30 tonnes of gold each year, the pit provides work and silver for around 550 employees. 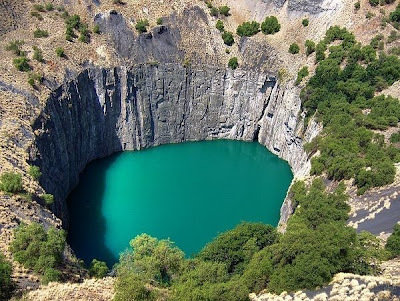 Another open pit whose name leaves little to the imagination, the Big Hole in Kimberly, South Africa, is said to be the largest hole excavated by hand – despite recent claims that the nearby Jagersfontein Mine holds the some might say dubious title. 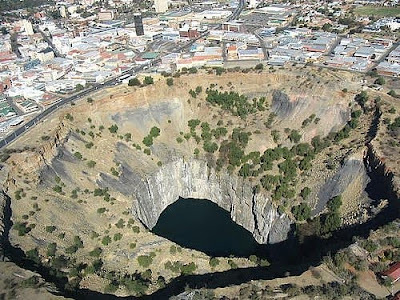 While it was closed in 1914, during its 43-year lifetime, the 50,000 workers who broke their backs using picks and shovels shifted 22.5 million tonnes of earth, yielding almost 3 tonnes of diamonds for their jolly bosses, the de Beer brothers. 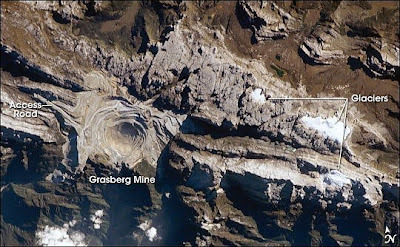 The Big Hole is 463 metres wide and was dug to a depth of 240 m – though infilling and water-accumulation have left just 175 m of the hole visible. It’s now a show mine complete with a restored old town. Quaint. 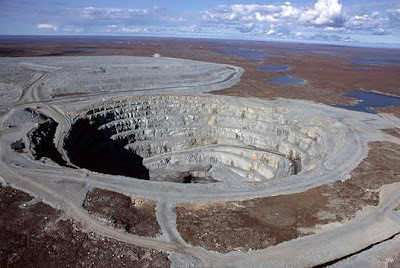 Diavik Diamond Mine is located in Canada’s charmingly named North Slave Region – hopefully no reflection on the way the 700 workers here are treated. This is an open cast mine like no other. Gouged into a 20 square km island, 220 km from the Arctic Circle, there are particularly jaw-dropping views of this cold spot when the surrounding waters freeze over. Connected by a treacherous ice road, this remote mine takes some getting to and so even has its own airport big enough to accommodate Boeing 747s. 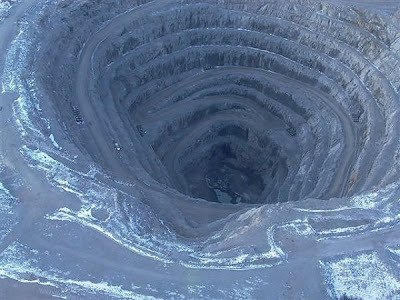 With a lifespan of 16 to 22 years, the owners will be happy as long as this yawning hole continues to throw up 8 million carats (1600 kg) of diamonds a year. 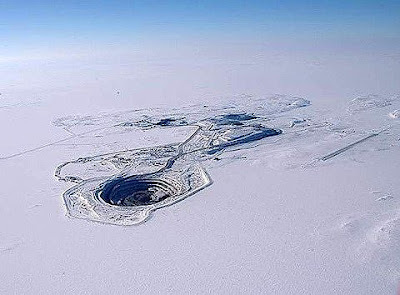 Another giant crater in the grizzled face of Canada, the Ekati Diamond Mine is North America’s first commercial diamond mine – having opened in 1998 – and those still dazzled by diamond rush fever no doubt hope it won’t be the last. It’s actually only a stone’s throw from the Diavic Mine just 20 km closer to the Arctic Circle – ensuring things here stay colder than a penguin’s pecker. Like its brethren blemish in Diavic, the Ekati Mine is accessed by hair-raising ice roads and got its 15 minutes of fame on The History Channel’s Ice Road Truckers programme. Darned crazy canucks? Driven mad perhaps by the 40 million plus carats (8,000 kg) of diamonds the steady scouring has so far produced. 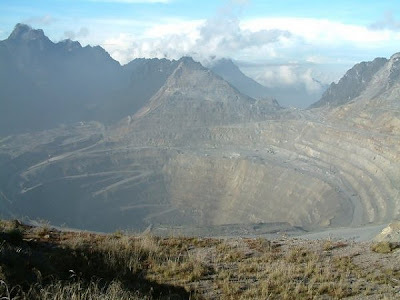 Opened in 1973, Indonesia’s Grasberg Mine is the world’s biggest gold mine and third largest copper mine. This industrial eyesore in the mountains of Papua employs a staggering 19,500 workers but is majority owned by smiling US subsidiaries. Built with permission it was not really the Indonesian government’s to give, the mine was attacked by the rebel Free Papua Movement in 1977. These days, steep aerial tramways ferry equipment and people in and out. 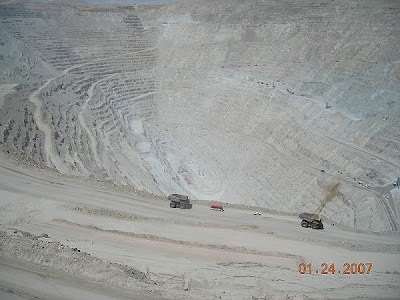 In 2006, the mine coughed up 610,800 tonnes of copper and 58 tonnes of gold, but it doesn’t take much digging to find environmental controversy surrounding the site, with water contamination and landslides heading the list of concerns. Contentious. 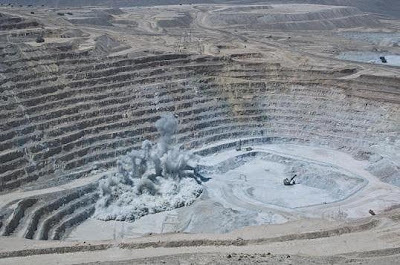 Chuquicamata in Chile is a colossus of a mine that has churned up a record total of 29 million tonnes of copper. 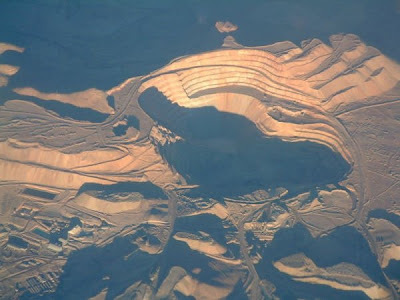 Despite almost 100 years of intensive exploitation, it remains among the largest known copper resources, and its open pit is one of the biggest at a whopping great 4.3 km long, 3 km wide and over 850 m deep. Copper has been mined for centuries at Chuquicamata, as shown by the 1898 discovery of a mummy dated around 550 AD found trapped in an ancient mine shaft by a cave-in. A great influx of miners was sucked in by ‘Red Gold Fever’ after the War of the Pacific, when at one stage the area was covered with unruly mining camps where alcohol, gambling, prostitution and even murder were rife. Yee-haw. 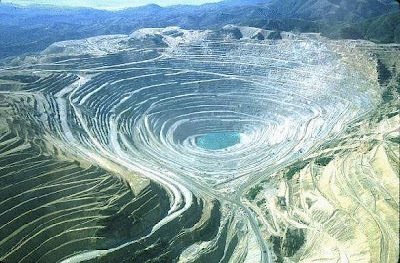 The Minera Escondida Mining Co. runs twin open pit mines cut into the skin of the copper capital of the world that is Chile. 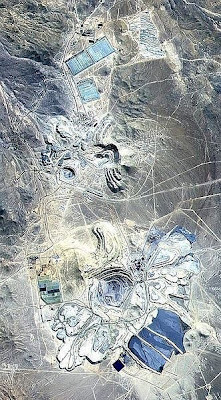 Construction began in 1990, and this sucker recently overtook Chuquicamata as the world’s largest annual copper producer, with its 2007 yield of 1.48 million tonnes worth US$ 10.12 billion – a whole lot of dollar. Environmental impact aside, Escondida has become a key part of the Chilean economy and employs some 2,951 people directly. A strike in 2006 broke out because workers felt they were not sharing in the super high profits being made on the back of record copper prices. After wrangling for pay demands, the union briefly blockaded the road to the mine. Testy stuff. 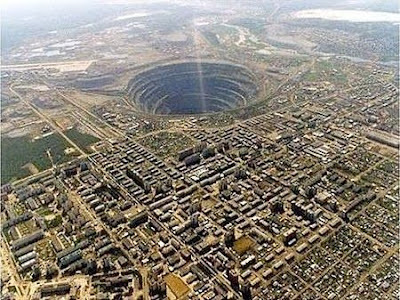 Like the Sarlacc Pit on Steroids, the Udachnaya Mine in Russia is a gigantic open-pit diamond mine that plunges more than 600 metres into the earth’s crust. Yep, it’s one heck of a hole. Located in Russia’s vast but sparsely populated Sakha Republic, just outside the Arctic circle, it seems that mining for these precious stones demands a good set of thermal undies. 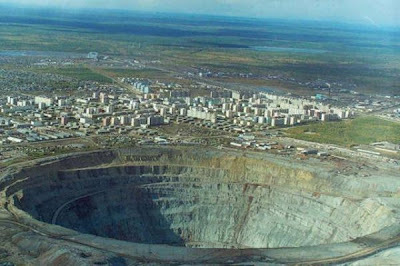 The nearby settlement of Udachny was named after the diamond deposit, which was discovered in 1955 just days after the Mir (below). 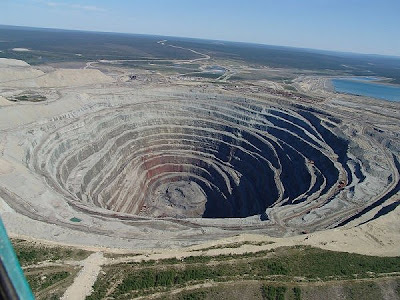 The Udachnaya pipe is controlled by Alrosa, Russia’s largest diamond company, which boasts that it plans to halt open-pit mining in favour of underground mining in 2010. Glad to hear it. 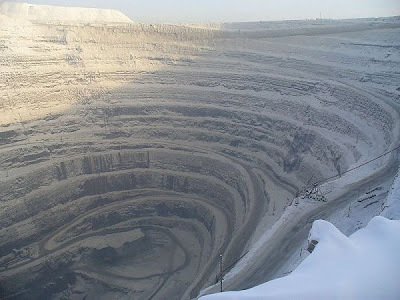 Siberia’s Mir Diamond Mine comes close to taking the cake as numero holie. 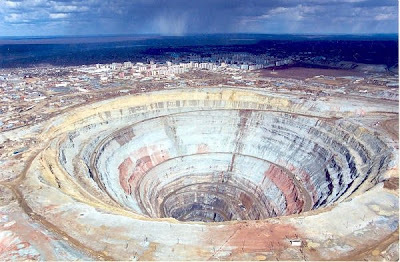 The largest open diamond mine in the world, this Russian monster has a surface diameter of 1.2 km and is 525 m deep. The size of the hole is such that wind currents inside cause a downdraft that has resulted in helicopters being sucked in and crashing. Good to know the area above it is now a no-fly zone. After its discovery in 1955, workers at the Mir had to endure incredibly harsh temperatures that froze the ground and everything else in the winter, making car tires and steel shatter. 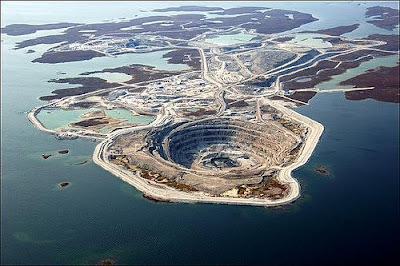 The mine ceased operations in 2001, having produced 10 million carats (2 tonnes) of diamond per year at its peak. Our survey says: ka-bling. 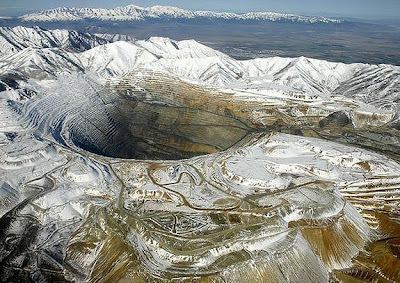 So here it is, the carbuncle supremo, Bingham Canyon Mine in Utah, the world’s biggest manmade pit. This mammoth mine measures 4 km wide and drops a stomach-churning 1.2 km into the ground, the result of extraction begun in 1863. 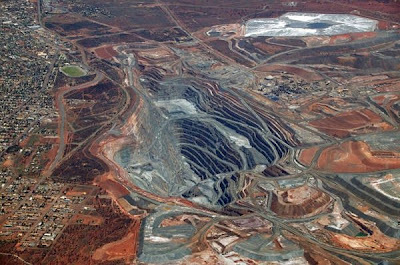 The ore-inspiring fruits of its labour include more than 17 million tonnes of copper and 715 tonnes of gold – a mental load of metal. In the early 1900s, mining camps lined the steep canyon walls, but several of these were swallowed up by the ever-expanding mine. Now it employs 1,400 people and 50,000 tonnes of material are removed from it each day. What’s more, this giant earth scar and National Historic Landmark is growing – and will continue to until at least 2013.